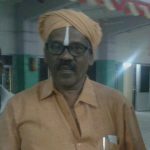 Dalit leader John Pandian may not be anyone’s idea of a pious Hindu partaking in rituals. Though a Christian by faith, he took his dip in Tamirabarani at the ongoing pushkaram that drew to a close on Tuesday. He says he has heard about the astrological significance of the event although he personally doesn’t know much. Pandian says he was invited by Jeer followers. “They told me to worship the sun, and then take water in my hands and pour it back into the river before taking a dip,” he says. Pandian says he saw lakhs of people take part cutting across caste and religious background. “I took part in the pushkaram with the aim of promoting harmony among people,” he says. Police have estimated that some 23 lakhs of people came and took a ritual dip in the river during the mahapushkaram. Organized by religious groups, many affiliated to the RSS and its organizations, the pushkaram has leveraged the deep love and affection that the people of Tirunelveli region have for the river. The mahapushkaram can be called a successful religious event organized on a mass scale. Among the critics is Tho Paramasivam, a scholar and former professor at the Manonmaniam Sundaranar University. 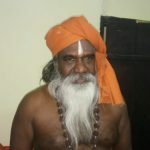 He says there is no record that the pushkaram happened 144 years ago and he disputes the validity of any astrological significance. Agreeing with him is G Bhaskar, district secretary of Tirunelveli CPM. He sees the pushkaram as a ploy to divert people’s attention from issues such as corporate exploitation of the river and restricting access to common people for drinking and agriculture. BJP leader Nainar Nagendran says the pushkaram was organized for religious reasons alone and not for any political motive. “We are not looking for any political benefit,” he adds. The marriage hall at Papanasam was overflowing with priests. Every day, religious events were held here since the start of the mahapushkaram. When this reporter asked around who was in-charge, many pointed to Ramanand Maharaj, a sanyasi. With a white beard, Ramanand Maharaj does seem to be in-charge. He has priests and volunteers coming to him for directions. “Last year we organized the Cauvery Mahapushkaram. This year it is the turn of Tamirabarani,” says Maharaj who says he belongs to a sanyasi forum associated with the Vishva Hindu Parishad. Every rashi (Hindu zodiac sign) is also a river goddess, he says. The Ganges is for Mesha Rashi, Narmadha is for Rishaba, and for Vrichika it is Tamirabarani. Since the planet Guru (Jupiter) has transited to Vrichika, the pushkaram is being celebrated here. “Last year, the Guru planet was in Thulam which is for Cauvery,” he adds. The Mahapushkaram happens once every 12 Guru transits, i.e., once every 144 years. What comes during every Guru transit is called pushkaram and happens every 12 years, explains Ramanand Maharaj. He says that his organization that consists of 150 sanyasis helps to conduct pushkarams all over India. The RSS and its affiliates help in organizing these, he adds. Ramanand Maharaj says work started right after Cauvery pushkaram. People at villages spanning all the 149 ghats were contacted and facilities for pilgrims who would come for a dip were made. Safety arrangements were put in place and a campaign was launched to publicize the mahapushkaram. Five more days were left for the pushkaram to end and Ramanand Maharaj was confident several lakhs of people will come. All through the pushkaram, rituals were conducted and food was being arranged. 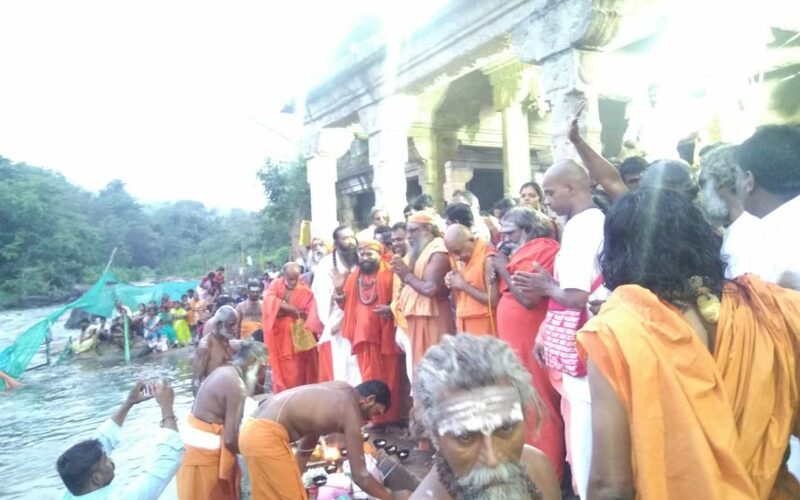 Ramanand Maharaj thanks Kanchi and Sringeri Shankara Mutts for chipping in, adding that he did Chaturvedi Parayanam on behalf of the Sringeri Mutt. Born in a Brahmin family in Tirunelveli, C Krishnan took to the rituals. Now living in Coimbatore, Krishnan has been observing traditional brahminical rituals in any case. He had come to take a dip in Kurukkuthurai ghat. “I was asked to keep the divinities associated with the river in mind and take 11 dips chanting some mantras. I did it,” he says. Krishnan then did tharpanam — rituals for his ancestors. For 70-year-old Madanmohan, it was the second time he was taking a dip at Papanasam. Spirituality is a way of life for him. Madanamohan eats only organic food and is keenly aware of the astrological significance of mahapushkaram but he doesn’t chant mantras while taking a dip. “Those are for brahmins. I don’t follow those traditions,” he said. Paramasivan had come with his family to Kurukkuthurai from his Palayamkottai home. He may come from a Dalit caste group but he too is aware of the significance of Jupiter transit and the connect with Tamirabarani although this is the first time he is hearing the word pushkaram or its association with the Tamirabarani. “I prayed for my ancestors as well as my favourite gods and goddesses. I think I am fortunate that I got a chance to take a bath here,” he adds. Among the religious leaders of divergent traditions who came to Tamirabarani for pushkaram was Bala Janathipathi who comes in the Ayyavazhi tradition. Largely drawing from the nadar caste group, Ayyavazhi emerged in the 19th century as a social reform movement in the erstwhile Travancore province. Its founder Ayya Vaikundar opposed the caste system. Diverging from Hindu practices such as idol worship, his followers worshipped lights and mirrors. Politically, in the past, Ayyavazhi leaders associated themselves sometimes with reformists and the Left, too, and kept away from the BJP. Bala Janathipathi does accept there was an internal debate over participation in the pushkaram. “Our Ayya’s ancestors followed these traditions. In that context, we have come to take part in the pushkaram,” said he. On Oct 16, thousands of Ayyavazhi followers wearing saffron came in a procession to Papanasam led by Bala Janathipathi and were received by the sanyasis led by Ramanand Maharaj. “Some six months ago, they had invited us to the programme planning meeting in which I participated. It was decided at that meeting to conduct the Ayyavazhi conference on October 16,” says Bala Janathipathi. Starting with a reading of the Thiru-edu, the conference had art events too. With momentum gathering among the people hailing from this region who are typically very attached to their river, Muslims and Christians too felt drawn to take part in the pushkaram. A group of Muslims at Melaseval took a dip in the river and performed namaz on the banks. Just like many living away from the Tirunelveli region made a trip back home for the pushkaram, Jamaludeen who lives in Chennai too went back to Melaseval. “Going beyond caste and religion, Tamirabarani has given life and riches to us. We participated in the pushkaram for the sake of communal harmony,” he said. This topic contains 0 replies, has 1 voice, and was last updated by Inmathi Staff 5 months, 4 weeks ago.